The Emma 30 inch vanity embraces purity of design and masterful construction. The vanity in Dove Gray finish paired with brushed nickel hardware brings to life the cabinet's simple, clean lines. Emma provides abundant storage and Zen-like functionality. Soft-close glides and hinges keep things quiet and the solid wood frame and dovetail joints keep things strong. The collection also features complementary mirror and linen tower to expand the look. Emma makes your bathroom beautiful. The Colton 30 inch vanity captures attention with its stunning Basil Green finish, brushed nickel hardware, and lovely louver doors. But Colton's construction is equally as compelling. Solid birch wood frame, dovetail joints, soft-close glides and hinges, plus flip-down drawers beneath the sinks means Colton delivers quality in both form and function. Complete the look with matching mirror and linen tower. You cannot miss with Colton. The Dexter 43 inch vanity offers a combination of styles where country meets contemporary. From its Rustic Gray finish to it striking metal inset, Dexter blends rural and industrial details to create an intriguing cabinet that will be the centrepiece of your bathroom. A solid ash wood frame, soft-close hinges, and simple pulls finished in black bronze complete the look of this unpretentious but beautiful piece of bathroom furniture. A matching mirror is also available. Dexter defines modern bathroom design. 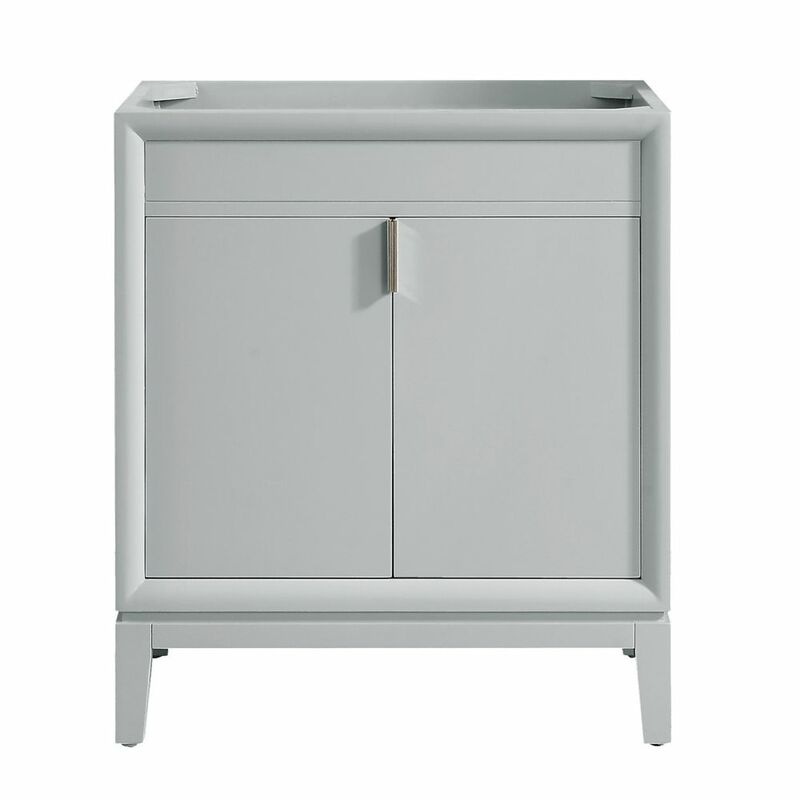 Emma 30 inch Vanity Only in Dove Gray The Emma 30 inch vanity embraces purity of design and masterful construction. The vanity in Dove Gray finish paired with brushed nickel hardware brings to life the cabinet's simple, clean lines. Emma provides abundant storage and Zen-like functionality. Soft-close glides and hinges keep things quiet and the solid wood frame and dovetail joints keep things strong. The collection also features complementary mirror and linen tower to expand the look. Emma makes your bathroom beautiful.